Wentworth students apply innovation to meet the world’s challenges. Libretto used great writing to address Wentworth’s. Established in 1904 and located in the heart of Boston, Wentworth has both reaffirmed and reinvented itself in its second century, emphasizing cooperative learning and entrepreneurship as important components of its rich and rigorous programs focused on science and technology. To reflect this forward-thinking orientation, the Institute sought to update its full suite of admissions materials. Working with our creative partner Stoltze Design, Libretto began with an assessment of Wentworth's institutional messaging. The Institute’s five pillars became the Five Factors of Career Success, with supporting messaging developed for each pillar. Admissions materials were then developed around the overarching theme of "Innovation in the Making," which expressed a core value of the school's institutional value proposition. 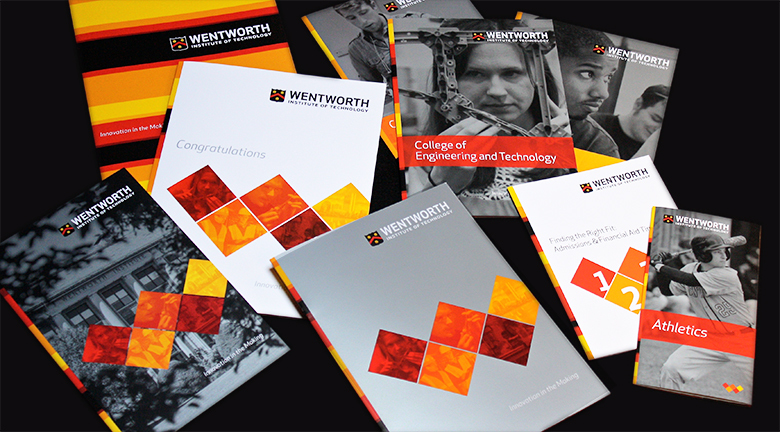 Among the pieces we developed were an undergraduate viewbook; brochures for Wentworth’s College of Architecture, Design and Construction Management, College of Engineering and Technology, and College of Arts and Sciences; an athletics brochure; travel brochure; acceptance kit; parent’s guide; and visit poster. Before long, word began to spread about the new materials, and we started to receive requests from other areas of Wentworth. A brochure for the Master’s in Architecture program. The President’s Report – which received a Bronze Award at the CASE District I Conference 2016. Appeals for the Annual Fund. Collateral and student profiles for the College of Professional and Continuing Education (as well as a new set of Five Factors specifically for CPCE). A comprehensive rewrite of the Institute's website. Libretto and Wentworth continue to reap the mutual benefits of this ongoing relationship. "The writing throughout is strong and informative. [...] Gorgeous, great, clear, accessible writing."